Stand-Alone Barcode reader for Access Control, Time & Attendance, and Data Collection. 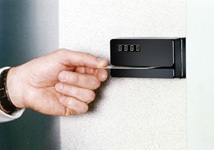 The Smart Slot STA is a stand-alone barcode swipe reader with audit trail, designed for use in Access Control. The reader contains up to 512K of memory for storing an access list of thousands of employees. The access list can be downloaded into the reader from a PC, or you can enroll cards locally at the reader. Access schedules are also supported, allowing you to specify at what times an employee is allowed access. Available interfaces are Rs232, Rs422, usb, and tcp/ip. Readers are also available with POE, where the power for the reader and the door strike or maglock are taken directly from an ethernet switch, eliminating the need for a local power supply. Portable readers are also available for portable Access Control applications such as guard shacks.